Free teaching resources for your classroom! Here is a collection of free printable research mini books! Your students will love sharing their findings in this "professional" format. a three-page booklet with a decorated cover. Students add three titles and write their information on each page. 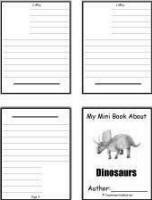 A blank area on each page of the booklet is provided so that students may add an illustration.